muoncounter at 02:39 AM, most animals are very sensitive to subtle changes occurring in their natural environment. This is almost always reflected in their reproductive process where breeding rates adjust according to the coming seasonal conditions. For those animals that produce multiple offspring, the "choice" as to how many there will be is made at the beginning of the breeding cycle well before the conditions that will support the increased numbers that eventuate are evident, to man at least. It is not a case of always producing multiple births and the excess perish, animals that normal carry one offspring, or at times miss breeding altogether, will suddenly carry multiple embryo's. Another example that is often observed is water birds building nests at elevations that seem to account for the coming seasonal water level. I don't see this as strange, as whilst most people are becoming even more oblivious to coming change, (how many people need to be told by the TV news that it's going to rain whilst others sense it days, even weeks ahead), the change when it eventuates is not a spontaneous happening, but the culmination of a long process where subtle indicators begin to appear well before the eventual outcome. This is witnessed by our increasing ability to produce more accurate short and long range forecasts, the difference between those who have limited ability, and those who seem to have an uncanny ability, is that the latter have discovered what the most relevant indicators are, that combined produce an accurate prediction. Whist man must rely on formulas and theories in order to bring it all together, and this is the important bit, it is all based on measurements that are taken from the physical world. Now taking the forecasting of SST's as an example, some researchers believe they now have the ability to accurately forecast perhaps two years ahead. That means that the indicators they are tracking this very day are changing in such a way, that they indicate the beginning of a process leading to an eventual outcome in two years time. It may well be that that process is already well advanced, but man's ability to sense it, and thus measure it is still very limited. Thus if we accept that what occurs at any point in time is not a spontaneous event, (even though some people always seem to get soaked because they didn't have a clue it was going to rain), but instead a result of a long ongoing process, don't you think that at least some of the animals that live in that physical world are also able to sense well ahead of time, those subtle changes that we are only finally learning to map and understand. johnd, and we must also acknowledge that, every single year, some birds fly off in the wrong direction for their escape from winter. johnd#151: "I don't see this as strange"
So a hundred lost seals are news for Watt$ and co. But the 8,999,900 who know where they are don't get a mention. Now that's a cherrypick! I am suprised no-one has mentioned that Harp Seals in the North Atlantic breed on the sea ice in Canada. There was little or no sea ice in this area of Canada this winter. The Harp seals had no where to breed on the ice so some wandered off. The appearance of Harp seals in the USA is more likely due to loss of habitat in Canada, due to the ice melting from AGW, than because they are physic and think it is getting colder.This article from the Humane society of Canada claims that the seals were forced to give birth on shore in 2010 (I could not find a scientific reference for harp seals birthing on shore, there has not been enough time for it to be published). Lack of suitable habitat would account for seals wandering more than usual. michael sweet, the other reason more harp seals show up farther away is that there are more of them. See figure 7 here: http://www.dfo-mpo.gc.ca/fm-gp/seal-phoque/seal_harp_%202009-eng.pdf Their biggest problem by far is hunting, not ice. We can agree that Harp seals appearing in small numbers in the Northern USA are not an indication of global cooling. "Don't trust any of those elitist scientists and their modern, new-fangled, hoity-toity instruments and measurements - nature knows the truth and we will trust them to reveal their secret knowledge to those who we want to believe can understand what they are trying to say to us. Until anyone can actually speak to nature and interpret it, we can never be disproved and can believe what our internet gurus and blog scientists tell us !" Johnd #151...So should I use a crystal ball or tea leaves? What do you recommend? We are talking about science here man. Can you propose a mechanism by which these sensory-special organisms actually predict changes in climate? Weather maybe, and of course seasonal changes, but climate? Following Phil Jones' update yesterday (10th June 2011), this subject has become a hot potato in the comments over at Carbon Brief. Anyone fancy offering expert support? A casual review of daily averages of high-arctic (80-90 N) air temperatures over the 50-year record suggests that summer temperatures in this particular region of the Earth have decreased a smidgen over time, according to archived data at DMI’s Centre for Ocean and Ice . A discussion on Neven’s Arctic Sea Ice Blog has brought forward a couple of possible explanations for this which sound quite plausible to me, but I have no expertise in this area. Do you know of any published discernment on this? Perhaps someone can give me information. There has been no warming of the atmosphere since 2001. Since there has been millions of tons of CO2 emitted why is that ? Does anyone have a link to a graph of aerosol emissions ? [DB] Please separate these questions into individual comments placed on more appropriate threads; as constructed this comment amounts to a Gish Gallop & thus needs no refuting. Thanks! NETDR, yes we've seen cherry picking before. Let's look at this a bit more broadly, shall we? So... you can find a negative trend from seven of the past 161 years to present. None of which shows a statistically significant trend, because they were all within the past decade. There have been much more pronounced 'cooling' trends in past decades despite rising CO2 levels. There is nothing at all surprising about that or the current downturn... because CO2 is not the only thing which impacts atmospheric temperatures. The reason that we have failed to warm since 2001 is that the ocean currents [PDO] have turned negative and we will have more La Nina's than El Nino's for 20 to 30 more years. Notice that since 2000 the El Nino's have about balanced the La Nina's and it has warmed in the former and cooled in the latter. 2011 is a la Nina year and 2012 is predicted to be one too so it will be cooler probably for many years. The slow warming is of interest only to climatologists and in no way is a problem for mankind. [DB] "The slow warming is of interest only to climatologists and in no way is a problem for mankind." Unsupported, and off-topic, handwaving. See the "It's not Bad" thread. 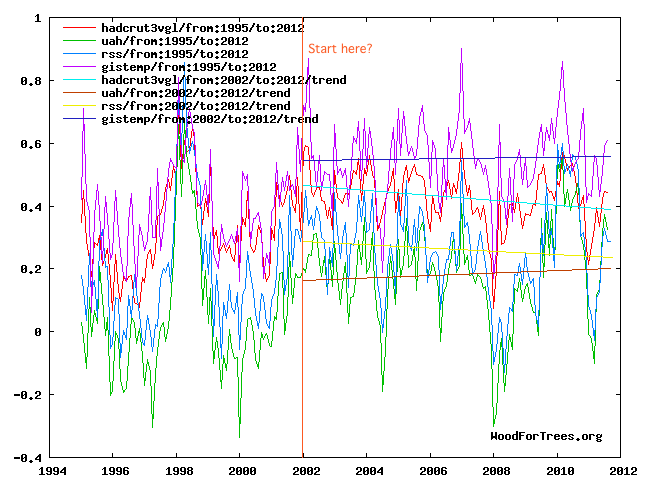 NETDR wrote : "There has been no warming of the atmosphere since 2001. Why not use all four temperature data sources ? There, you will find that the two smallest trends (which are negative) are HadCrut and RSS, while the larger (positive) trends are GISS and UAH. Why do you prefer the HadCrut figures ? Citation of peer reviewed evidence of this, please. Citation of peer reviewed evidence of this, please. And not just that we're going to have more La Nina's, but rather evidence that this is going to affect the long term global mean temperature. ... the El Nino's have about balanced the La Nina's and it has warmed in the former and cooled in the latter. Yes, pretty much as they always have. Is there a point in this, other than to imply without evidence or logic that ENSO itself causes warming or cooling? ...it will be cooler probably for many years. The slow warming is ... in no way is a problem for mankind. You don't understand the science. Please read Spencer Weart's The Discovery of Global Warming. Then come back here and go step by step through this site, like a true skeptic, trying to refute your own beliefs/arguments, and see what you discover. Hint: The globe has not been cooling. You might try actually reading the post on which you are commenting. Netdr: "we have failed to warm since 2001"
No the wookie doesn't win because the wookie's base premise is incorrect: 2010 tied for Warmest Year on Record. Although since you like to cherry pick, here's 2011's hottest summer on record. I entirely agree. There is a 1/2 ° C warming trend superimposed on a 60 year sine wave from ocean currents, but we cannot discuss this on this thread it is contrary to the "let the wookie appear to win policy"! Quibbling about whether it warmed or cooled during the last 12 years is pointless. Repetitive complaints about moderation snipped. Unsupported summary musings (i.e., handwavings) struck out. Please stick to the science, please. Nicely cherry-picked year. Well done. And naturally ending in a La Nina. Also well done. Here's the raw data, with your trends (for all data sources). NETDR wrote : "The reason that we have failed to warm since 2001 is that the ocean currents [PDO] have turned negative and we will have more La Nina's than El Nino's for 20 to 30 more years." Trying to ignore your cherry-pick of HadCrut data (and noting that two out of the four datasets show positive trends, i.e. warming), what do you base your prediction of "20 to 30 more years" on ? By the way, although I haven't analysed the data, the Japanese Meteorological Agency's dataset seems to show a positive trend since 2001 too. Any thoughts ? 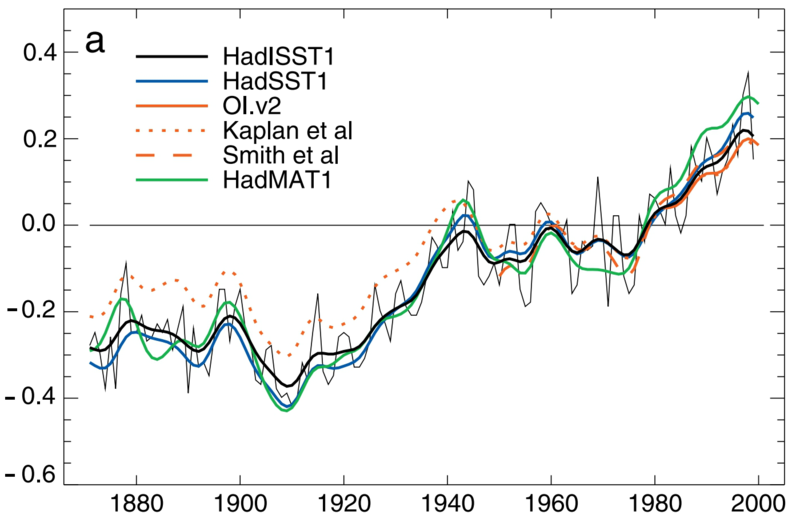 And WoodForTree's own Temperature Index ("...the mean of HADCRUT3VGL, GISTEMP, RSS and UAH, offset by their baseline differences...") also seems to show a positive trend. Tamino answer's part of #160 Tor B's comment at with a recent post on Arctic temperatures using NCAR data. He has a number of interesting graphs for the 80-90N region, and they appear to show significant warming in that region. I'm unsure as to the mechanisms discussed at Neven's blog however as the link is to his homepage. Since my point is that the sine wave has turned negative and that we have entered a time of cooling because of more La Nina's than El Nino's the short term cooling is entirely germane. A negative PDO doesn't guarantee all La Nina's it just means the dice are loaded. The El Nino of 2010 caused a blip of warming. Since 2011 is a La Nina year and predictions seem to predict that 2012 will be too. It doesn't make much sense to focus on the 1978 to 1998 warming since conditions have changed since then. I contend that we are at the start of a 20 to 30 year cooling cycle. Netdr#173: "we are at the start of a 20 to 30 year cooling cycle." Yet just here, you posited that it has failed to warm since 2001. So we are ... 10 years into your 20-30 year cooling? And we just had the hottest year on record. Funny kind of cooling, that. NETDR - right. And if climate science turns about to be correct (ie it keeps warming as predicted), will you graciously return here to agree and then move on to work for GHG reduction? Or it will it be try to find another excuse for inaction? NETDR writes: "I contend that we are at the start of a 20 to 30 year cooling cycle"
I very much hope you are right; sadly your reasoning is very shaky. Looking at time series data and detecting a pattern does not mean that the pattern inquestion has any physical basis, but without a physical basis there is no good reason to think that the pattern will continue intop the future. In the case of the cycles linked to PDO, the problem is that there have been changes in other forcings, so how can you tell that the cycle is real rather than being the result of changes in other forcings that have coincided to form what appears to be a cycle and a bit of an oscillation? You can't tell by statistical means which is which (as correllation does not imply cuasation), you can only tell the difference via physics. So, has anyone produced a physical model that reproduces the observed cycle as a result of PDO, rather than as a result of known changes in the other forcings, such as solr forcing? I think you will find the answer to that question is "no", simply becuase once you include physics into the argument it quickly becomes apparent that PDO can have caused little of the observed variation. 11th warmest year on record, but 1st warmest comparable la nina year on record according to NOAA...hmm? Does this mean anything? Below is a cogent argument showing that, whilst warming is happening in the long-run, the gradient is decreasing and a maximum is likely by 2200, being only about 1 degree C above current levels. The most informative plot I have seen compares gradients derived from 30 year trends calculated on a moving basis every month. I have added the yellow trend line which shows a decrease in the gradient over the 100+ year period. No one can call this cherry picking - it's nearly all the data we have. The reason for the decline in gradient is that the ~1000 year natural trend (evident in other data) is roughly sinusoidal and is approaching a maximum within 200 years. The decline should increase a little so the trend itself is cyclic and should pass through zero when that maximum occurs, for which temperatures look like being about 0.8 to 1.0 degree higher than at present. Response: [RH] Fixed image width. Climate-Change-Theory... Really? A trend of the trends? I don't know if I could define that as "cogent." So would you also say that the derivative and second derivative of a function tell you nothing about the original function? You would be in error if you did, and I suggest there are strong parallels with my argument. About 100 years ago sea surface temperatures were increasing at a rate of about 0.6 deg.C per decade, whereas now the yellow trend line shows they are only increasing at a rate of about 0.5 deg.C per decade. This I suggest is also supported by the fact that the second maximum gradient is lower than the first, meaning the world saw faster warming in the past when carbon dioxide levels were lower. Correction: Those rates should have an extra 0 of course, namely 0.06 deg.C per decade and 0.05 deg.C per decade. 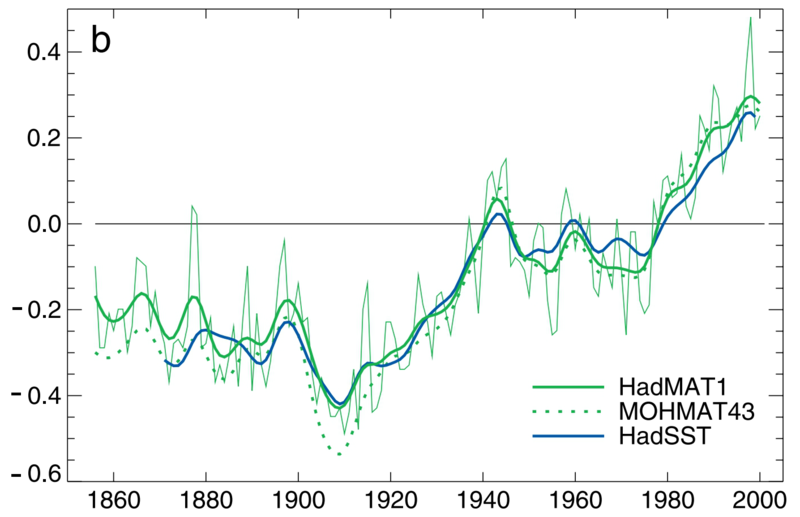 There is no way any logical extrapolation would show significantly greater rates of increase over the next century, so nothing in all the historical sea surface temperature data since 1900 gives any indication of a rise of more than about 0.5 degrees C in the trend by 2100. There could of course be random noise (or a natural 60 year cycle) causing temporary values above the trend, but the trend looks like increasing by only 0.4 to 0.5 degrees C by the year 2100. There are no grounds for assuming any increase in the rate of increase in temperatures based on this data. There is no anthropogenic component related to post-WWII industrialisation. Basically I am predicting that slight warming will continue for 100 to 200 years (maybe one degree (1 deg.C) higher in the trend by 2200) but natural cyclic cooling will then prevail for the following 500 years or so because of apparent natural cycles with about 1,000 year periodicity. But there can be no doubt that worldwide mean temperatures were warmish in the 12th century and coolish in the 17th century. When we see that long-term natural trend rates are only of the order of 0.5 deg.C per century, the scenario of alternate natural rises and falls of the order of 2 to 2.5 deg.C over periods of 500 years is far from implausible. The data from which that "hockey stick" was invented came from land based tree ring data. 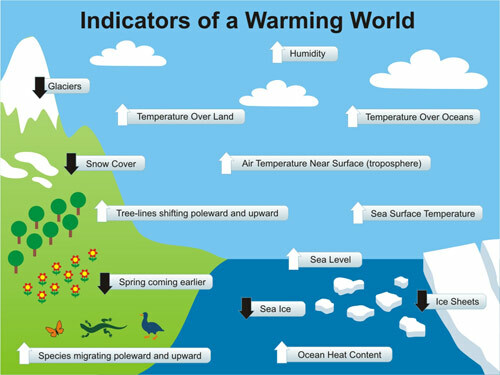 Land surfaces contain only about 1/15th of the thermal energy (wrongly called "heat") that is in the oceans. Hence sea surface temperatures are a far better indication of what's happening. Actual temperature measurements in islands like Northern Ireland could be indicative of sea surface trends and these show a linear trend since 1792 - also increasing by about 0.6 deg.C per century. So there is clear evidence that rates of the order of 0.6 deg.C per century have been the norm since the Little Ice Age and have not increased at all due to industrialisation. Doug Cotton (aka Climate Change Theory), the theory you are proposing here has no physical basis. Further, it requires very large changes in ocean heat content, and hence the total energy stored at the surface of the Earth with no change of energy in or out. Ergo it contradicts the conservation of energy. Tom: I suggest that weighting of land v. ocean should be in proportion to thermal energy content - ie roughly 1:15 so if you wish to throw in 1/15th weighting of land temperatures on top of sea surface I'm happy with that, but it can't make much difference. I am not proposing a theory when I am merely using a logical statistical and mathematical approach to analysing all sea surface data since 1900 and saying there is no evidence of any increase in the rate of increase about 100 years ago compared with current rates. Whichever way you look at the data, there is only a rise of the order of 0.05 to 0.06 deg.C per decade on average since 1900. Nothing suggests that an extrapolation to 2100 should exhibit a faster rate of increase in the underlying trend. If you produce any other analysis of that sea surface data since 1900 which shows a sound reason for a rise of significantly more than, say, 0.6 deg.C over the next 88 or 89 years until the year 2100 I will take my hat off to you if I can't fault your logic. Go for it! Here is the source of the original plot. Doing so shows sixty years of declining sea temperatures terminating at the start of your "logical and mathematical approach". As sixty years is the duration of one cycle that you have purportedly detected, a sixty year period of declining sea temperatures resoundingly falsifies your model as a predictor of past, and hence presumably future sea surface temperatures. Perhaps it is time you stopped plagiarizing Bob Tisdale by giving him blame for this analysis (there is no credit about it), and started relying on analysts who do not cherry pick their data. Tamino came up for a name for this sort of statistical analysis that ignores data and ignores physics - mathturbation. I do not particularly like the term, but in this case it definitely applies. Your analysis of Cotton's copious mistakes is spot on. However, tamino may have come up with many great things, but that particular term originated with economists. This definition predates tamino's 2011 usage by some 5 years. Climate-Change-Theory @ 178... What your chart tells us is that, except for one very brief period, the trend has been positive, and often strongly positive. And the trend is still at the high end. Looking at the trend of the trend tells you what? Zero, as far as I can tell. Climate Change Theory...There is an evident 1000 year cycle in glacial advance and retreat in the data from several locations around the world. This data also shows a net positive trend in glacial mass (two steps forward and one step back sort-of)over the last 8000 years or so. However, most of the 8000 years worth of slow glacial advance that has occurred has been erased in just a few decades. Something (aka anthropogenic CO2) is working against the natural forcing and winning. It appears that your 1000 year cycle has been supercharged. I would post charts and links, but I am not sure how to do this with my limited computer skills. If one were to believe the latest trend, it would imply that we believe athletes are getting fatter and slower. I'm not sure if this is the correct thread for these questions. I'm interested in why the rate of warming in the Northern Hemisphere is faster than the rate of warming in the Southern Hemisphere. a. The greater proportion of land to water surface in the North. b. The fast-spinning ring of air over the Arctic which affects the jet stream that helps drive the movement of winter storms. c. The localised effect of positive feedbacks such as Arctic amplification. Are these factors correct? Are there any other factors influencing this phenomenon? And now, 2012 (to date) is the hottest year on record. Science marches ever forward...;=/...and puts another nail in the denialista's insistence that there's "been no warming since 2001." "And now, 2012 (to date) is the hottest year on record." Not globally. I think you mean for the USA it's the warmest so far. Globally it will make the top ten, but won't approach the record. That of course doesn't mean that warming has stopped- it hasn't. And now we have not warming line repeated at the Daily Mail..again. It's the Daily double, and we're in jeopardy. Maybe this is the best thread here for this question. I found elsewhere on the net a plot of temperature versus year since 1850, attributed to SKS. I have determined that it is an average of 11 data sets...HadCrut, Giss, NOAA, RSS, UAH, NCEPRI, NCEPCFSR,NCEPTCR,ERA-40,ERA-interim. Only on the graph published someplace in SKS, however, is also fitted a red curve to the averaged data with an R squared given. Does anyone know what function this fit is to? Perhaps a best fit logarithm? I don't know how to find the graph on SKS in any of the many threads here, but hopefully someone else will know the answer. 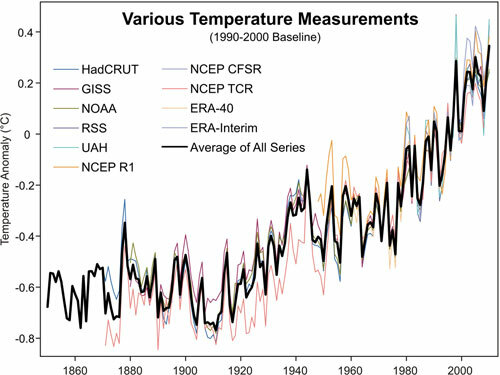 If so, the various temperature records are simply aligned to a common baseline as stated in the graph, and the dark line is the average (again, as stated in the graph). If you know of a graph with an additional overlaid fit, please give the URL and context, as vague references are less than useful. Scliu, you're more likely to get a response if you ask a specific question. Also, given the source, (Bob Tisdale) it's pretty obvious what people will make of it. "Tisdale at it again, after being repeatedly shown to be wrong". scliu94 - only in the mind of a climate science contrarian can the ocean heat data be unreliable so as to be unable to tell us the oceans are warming, yet reliable enough to confirm that the warming is natural!! An insurmountable hurdle for contrarians is that the largest natural component for warming the oceans - the sun- has seen a decline in radiation output over the last 3 decades, which should have seen a cooling of the oceans. Instead the oceans the oceans have warmed substantially - as they should when increased concentrations of greenhouse gases trap more heat in the oceans.